Months after this post, I am still banned from WebMD for my own good, but luckily for me, the New York Times prints plenty of fascinating medical information. This article was one example. The article talks about a variety of doctor behaviors that patients dislike, and the lack of feedback on these behaviors that doctors have traditionally gotten, as patients often just leave for a new doctor without giving a reason. In the article, some medical groups that have implemented patient surveys as a way to counter this problem share their experiences. Dr. Howard Beckman, medical director of the Rochester Independent Practice Association, often talks to doctors who receive low scores in patient satisfaction – often, he says, on measures of how well patients thought they were listened to. He described his surefire method as “You use continuers. As you’re working with people, you say ‘uh huh’ three times.” And then he went on to describe doctors who tried this and discovered that they were able to get closer to the heart of the problem. One doctor talked with a patient who initially complained of chest pains. The doctor said “uh huh” the first time and found out that the patient also suffered from headaches. He said “uh huh” again, and the patient finally mentioned that the pains started when his brother died unexpectedly. The doctor was stunned that it worked – and while he might still order the same medical tests, he had a lot more context for what those results might mean than if he had immediately concluded that the man had a heart or head ailment. When I read this anecdote, I immediately thought about conferring. Specifically, research. How often, I wondered, had I bulldozed past a kid’s thinking by rushing the research? How often had I heard a likely teaching point emerge from a kid’s first remark and felt relieved (“Finally, a conference where I know what to say!”) and then cut the research short, maybe too short? So I started to try this out. I would say “uh huh” or “hmmm” or “Tell me more” three times, to see what would happen. What didn’t happen was my secret fear — kids staring at me like I was out of my mind, or a little dumb. I worried that kids might think, “Why is she asking me to say more AGAIN?” but in fact, most of the kids I talked to seemed perfectly happy to go on and add more. What did happen was that kids opened up more, and pushed themselves more. Instead of “Julian and Charlotte in Wonder are really different” and then a laundry list of reasons why, I started to hear “They both want attention.” Instead of “I could revise by changing my lead”, I got “Also, I could cut what doesn’t fit well, and I want to make it more exciting, and also I think this scene here could get better.” And instead of hearing the clock ticking toward desperately locating some kind of teaching point to use, I started to hear kids’ voices better. It might seem that a simple prescription to say certain words in certain combinations couldn’t possibly be enough to make a meaningful change in my teaching practice. But the simplicity of the concept helped it to stick in my mind, and the response of kids when they were invited to talk more was worth the effort. Carl Anderson writes, “By truly listening to [our students] as we confer, we let them know that the work they’re doing as writers matters” (How’s It Going, page 23). The heart of conferring well is listening — so it’s worth doing whatever we can do to get kids to say more, and say more, and say more. One of the best things about summer institute season for my colleagues and I is that we get to travel the country and see places we might have otherwise never been. This summer, for instance, I got to tour a peach orchard in Houston County, Georgia, walk the boardwalk at the Jersey Shore, and shop for jewelry in Mystic, Connecticut. 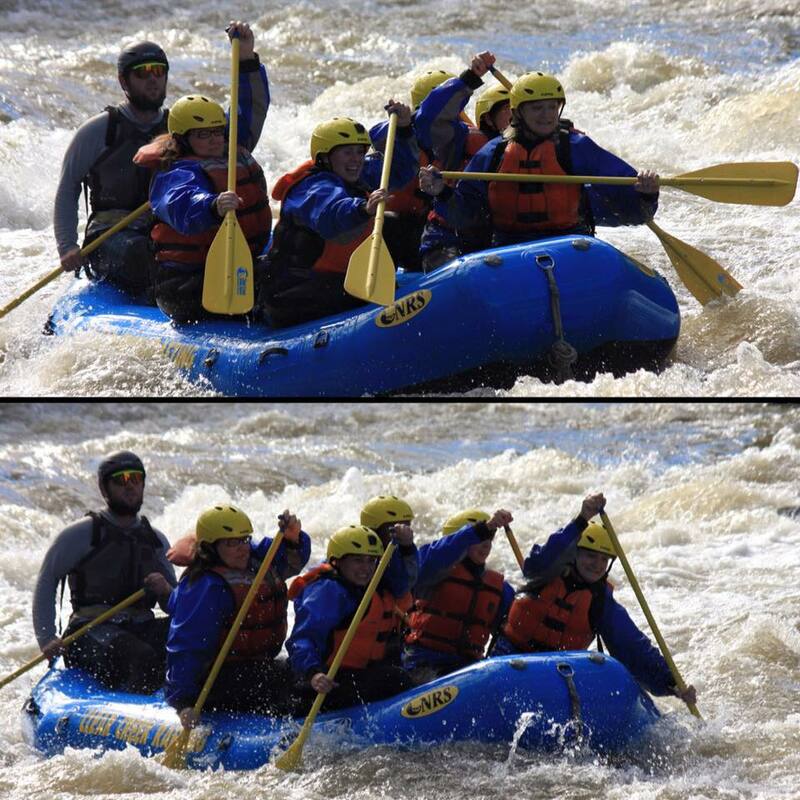 Most recently, I got to do something super cool that I had never done before, in the company of some spectacular colleagues – whitewater rafting! We drove up to Idaho Springs, CO and were thrust surprisingly quickly from professional outfits and presenter mindsets to wetsuits and total newbie status. Trevor, our guide, taught us the basics of paddling before we hoisted the raft into Clear Creek and set off. There were so many things that were amazing about this adventure – including the fact that none of us fell out! And of course, since I was traveling with a posse of staff developers, when we stopped for post-rafting burgers at Tommyknockers, the conversation drifted into teaching and teamwork and what we might bring back into classrooms from the rapids. Despite the fact that we were all beginners, Trevor inducted us into the language and the community of whitewater rafters. He did this mostly by using the terminology of rafting, over and over again, in context. If we asked, he explained a word. Sometimes he’d offer up an explanation of why a particular rapid got its name (one was named after the highway exit you could see as you paddled by), or what adventure was about to come up (going over a hole) but most of the vocabulary I learned, I learned because he said it so often! When I think about our kids growing as writers, readers, mathematicians, historians, scientists, artists, athletes, and even rafters, one of the things that always seems to distinguish a rookie from a pro is their command of the vocabulary (including slang and idioms) of their craft. Sometimes, as teachers, it feels like we have a massive job on our hands – how are we supposed to teach kids ALL this specialized vocabulary, on top of teaching them to actually DO the things the vocabulary suggests? It’s easy to throw up your hands and ignore the vocabulary, or to over-emphasize learning terms in isolation – I’ve certainly been guilty of both at times! But my experience with Trevor on the raft is making me think that looking to other types of teachers and other fields could be a good way to figure out how people really learn to talk like a pro in their field. Rafting day trips, weekend sports clubs, first days at new jobs, music lessons…all of these kinds of places require people to take on a role and act like experts before they really are. Acting like experts helps rookies gain confidence and eventually gain expertise. And a big part of acting expert is sounding expert – talking with the right lingo. A: “Stories, narratives, are made up of smaller scenes. And in all of those shorter scenes, you want to show your reader what’s happening, make us feel like we’re really there in the setting, experiencing what your protagonist is experiencing in that scene, instead of just telling us or just listing events. Writers call this “show, not tell.” Let me show you an example. Explicitly names not just words but phrases that feel like lingo or jargon (“show, not tell”) with enough words to make the jargon feel well-explained. Sounds excited about writing – like an invitation to the writing world is a really cool invitation to receive and is a field that’s worth learning the lingo of. Trevor, in coaching us through our whitewater rafting adventure, did a lot of A, and we left the water pumped up about what we had learned, confident in our ability to try again (soon!) and tossing around words like “yard sale” left and right. He harnessed the power of language to make us feel welcome in the “club” of rafting, just as we want our kids to feel like insiders in the club of literacy. And he made me think about the power of trying new adventures in our lives, so we can experience part of what our kids experience when they are diving into new worlds, new fields, and of course, new talk. P.S. — If you want to read my favorite vocabulary-related book, check out Bringing Words to Life, and if you want to go white water rafting near Denver, check out Clear Creek Rafting! Everyone has a geeky teaching passion, right? Vocabulary is definitely one of mine, and lately, I’ve been doing a lot of work on vocabulary with middle school science and social studies teachers. Word sorts, described in depth in Words Their Way, have long been a staple of many elementary word study programs, but haven’t always made their way up to middle school. 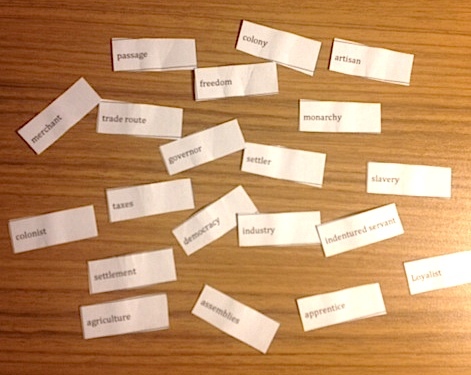 I’ve been asking groups of middle school content area teachers, groups of students, and really, groups of anyone I can find, to try out some content area word sorts, using a set of words pulled from the Colonial America era. 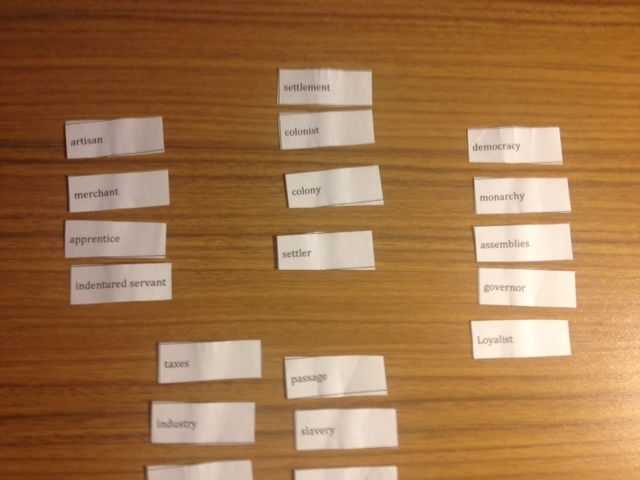 The idea of a word sort is in the name – you’re sorting a collection of words! In an “open” word sort, groups of kids (or teachers!) 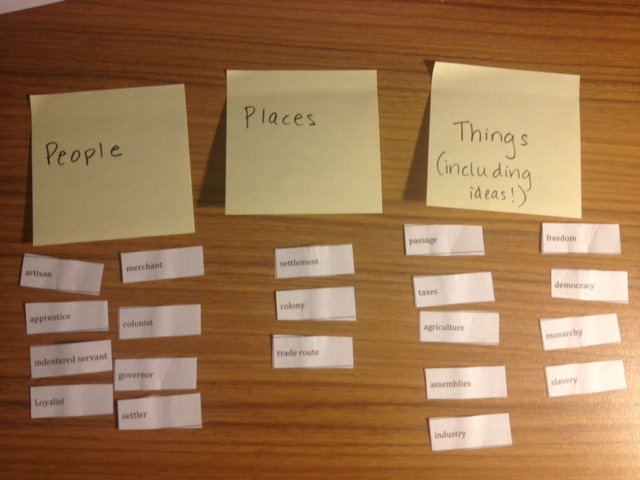 categorize the words into groups – any groups at all that the group works out. In a “closed” sort, you’d provide some labels for categories for the words to be sorted into. One of many ways that kids sometimes do an open sort with these words. Time after time, groups laid out their words and begin sorting, but quickly I became aware of what a lot of the groups weren’t doing – talking. In one group of teachers, I watched teachers conduct a lively, impassioned argument over where a word should go, just by moving the card, back and forth, back and forth – without a word spoken. In groups of kids, I often saw one or two kids emerge as leaders, and the others defer to them, sometimes without a word. Again, the existence of the physical cards stood in for conversation and although I could often guess at why someone moved a card into a specific pile, or imagine what their thinking probably was, I didn’t hear it and I wasn’t sure I was right. I realized a few things, watching this. First, that this is a harder task than it seems. It’s hard to name categories for concepts, and it’s hard to describe in words how things fit together, when sometimes it feels like they just DO. Second, when we see kids go silent (or go unproductive – “Yes it is!” “No it isn’t!” “Yes it is!”), that doesn’t necessarily mean that they’re shy, or quiet, or not sure of what to say, or not sure of the answer. The teachers doing this, for example, were all literate, thoughtful, eloquent adults, some of whom had extensive knowledge of Colonial America – and even they had trouble narrating their thinking. Third, I realized that the talking aspect of this task makes it much more challenging than if I had asked individuals to sort the cards – but also far more productive. The value of the task isn’t in getting the “right” sort, but in remembering or learning what the concepts mean and figuring out which other concepts are linked in different ways. This almost always requires some debate, or discussion. It may not require disagreement, but at the very least it requires a little noise. This third realization is the biggest one, to me. Talk can be a way of processing information, revising thinking, deepening comprehension. Talk is a way to make thinking visible so that you can coach into kids’ thinking, not just their final answers. And talk is a way to make good instructional activities great. As teachers we spend so much time developing powerful opportunities for kids to engage with rich, vibrant materials and ideas – but kids’ silence can thwart even the best-laid plans. So, the upshot? I think it makes sense to continue to nudge and push kids toward doing the talking in this kind of activity, even if it’s hard, and even if kids could perhaps make better (and certainly faster!) sorts independently. I think talking about words, using words, and talking about how to use words builds vocabulary and builds the webs that kids will use to keep track of and grow concepts in their content area studies. And I think that, like so many other facets of our school days, talk can be the bridge between our initial thoughts and the powerful webs of new thinking that school can help us grow. 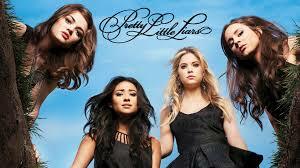 The Pretty Little Liars follow in the footsteps of almost every teen sleuth, adventurer, would-be vampire, and newly psychic debutante. They are tortured, stalked, and nearly murdered on a regular basis with nary a word to a parent, teacher, or cop. So many times, watching the show, it seems obvious to the point of absurdity that if the girls would just confide in someone, and probably many someones, about what was happening, they wouldn’t have to spend all their free time exploring abandoned warehouses and breaking into poorly-secured insane asylums. To be fair, they do try, once or twice, asking for help, and it never goes well. I seem to recall a therapist in season 1 or 2 who wanted to help but was soon dispatched by “A”, the girls’ shadowy nemesis, and was never heard from again (or at least for a few seasons). But the teacher’s comment resonated with me – and not just by reminding me that Pretty Little Liars is not the most realistic television show I spend time with. It also made me think about how this show is an exaggerated manifestation of what is inside a lot of kids’ heads. I remember, as a kid, and especially as a teenager, feeling quite convinced that the struggles I was facing were definitely different from everyone else’s, and so there was just no way a teacher or parent would have experienced the same thing. No. Way. It always seemed more logical to try to solve my own problems, no matter the cost, rather than to ask for help. Now, I wasn’t facing down an endlessly sneaky and inexplicably wealthy murderous foe, but hopefully, neither are our students. What our students do face, though, can be just as bad – we all know the various “A”s that our kids deal with in their lives, from homelessness to bullying, from dealing with the kid who wants to cheat off their math test to coming out to homophobic parents. I don’t want kids to feel like they have to run to an adult for every little thing – agency is important! – but I also know that having someone in your corner for the tough stuff can make all the difference. When we think about talk in the classroom, we often are thinking about academic talk. I know I am. But the other kind of talk that matters so much is the life talk that we hope kids will have – asking for help, sharing what’s on their mind, reaching out when the situation demands. I don’t know, but I suspect, that kids who know they can use their partners, their teachers, and their voices to solve the problem of how Kate DiCamillo creates characters may also be able to use those tools to solve the problem of how to stop crying after their parents split up. And if that’s the case, then our teaching has done even more than help kids deploy reading strategies and write with passion – it’s helped show kids a way to live. Some relevant backstory: I am a bit of a hypochondriac. I have been banned (by friends and family, not – yet — by the sites’ owners!) from more self-diagnosis websites than I can count. However, I stubbornly maintain an interest in reading about doctors and medicine and horrifying diseases. Most of the time, this just makes me more anxious than usual. But every now and then, it pays off in some unexpected way. Like when I discovered this article on NPR, about the success of an experiment in which doctors shared their notes with patients. Apparently, patients who participated reported dramatic improvement in their understanding of their health needs as well as their control of and consistent use of treatments for different health conditions. Immediately (because I am a teacher and because the article didn’t actually feature any horrible flesh-eating diseases for me to worry about) my thoughts went to teaching and to the copious notes I tend to take when conferring with students. I started to wonder what kids thought I was writing when I sat down with them. 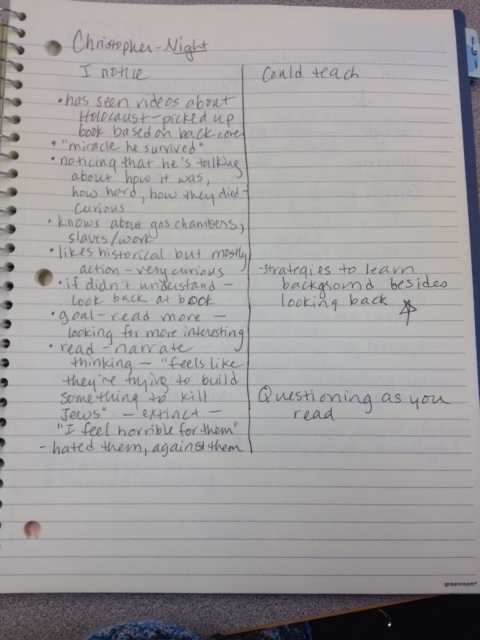 Without really intending to, I had used conferring notes almost exclusively as a teacher tool – something we might use to plan, diagnose, write report card comments, and so on. Something professional and private, in the way that a doctor’s notes are, traditionally, about you but not for you. As it happened, I went to a new doctor around the same time as I read this article, and she took my history with the computer facing me. Before she finished a section she showed me what she wrote and asked if that was right. I left feeling respected and listened to and a partner in my health care – just the way I want my kids to feel about their education. Walking out of her office, I felt confident in her care and I felt empowered about my next steps as a healthy person – and I also felt pretty confident that my records were accurate. This is a bigger deal than I realized — apparently, mistakes in medical records can be a huge problem. People are sometimes coded as having ailments they don’t really have, which impacts later insurance costs and also, more frighteningly, the treatments they get. In classrooms, we’re not risking performing surgery on the wrong organ when we get something wrong in our notes. But we are risking missing what really needs to be taught, and even more importantly, when we get it wrong, we’re risking missing an opportunity to connect with a kid. We’re also, a lot of times, missing out on conference notes altogether. Let’s be honest – we all know we’re supposed to keep conferring records, but many of us aren’t, or aren’t as consistently as we’d like. A lot of times, I think the reason is that we’re not ever using them. They feel like busywork, or work we use to prove to someone else that we’re doing our jobs, which is never an especially motivating reason to write. Here’s what I have been finding. When I share my notes with a kid as I confer with him or her, there’s a different tone to the conference. It feels more like working with the student, and less like interrogating or assessing them. Inviting a student to see what we’re writing makes it clear that we’re not writing our private judgment of their work, but instead that we’re taking them seriously enough to write down the words they say. It makes schooling feel not like something we do to kids, but something that kids actively participate in. What we found was that Christopher had a much better grasp on the historical context than we realized, and that he had a passionate desire to read this book. We found a few different things that we could teach him, too, and invited him to choose which one he thought might help him the most. The conference went well. But what really stood out to me was not the academic content of the conference – it was how interested Christopher was to look at my notes, to comment on what I wrote down, and to decide where his work as a reader should go next, and how we could help. Instead of sitting anxiously by a student, wondering when and if inspiration will strike – what is he doing in his reading? What is he good at? What am I supposed to teach this kid? – Christopher’s teacher and I were able to spend our conferring time really listening to what he had to say, engaging with him as a reader, and brainstorming some next moves he might need to make. The stress of figuring out the One Best Teaching Point, or of trying to look like a teacher who knows what she’s doing? Gone. We all want to be the kind of listener, the kind of teacher, who inspires kids to not just do what we tell them, but to own their learning and push beyond what we have thought to teach. This is a tough job – certainly much harder than just assigning tasks or goals, no matter how well-planned! Open notes conferring could be a path to greater independence, more engagement, and stronger connections between us and our thoughtful, fascinating readers. Student A: I liked it. It was cool. Student B: Thanks. I liked yours too. Teacher: Don’t forget to be specific! Student A: I liked when you said that thing about your dog. One way to tackle this is a fishbowl. In a fishbowl, you’ll generally have a kid, or a partnership, or a group in the center of the class, having a conference or book club discussion or some other component of your workshop, while the rest of the class watches, with some sort of purpose in mind. There are a million and one ways to use this discussion strategy, but if you want to use a fishbowl specifically to highlight what works in discussion, you’ll want to focus the class to listen to the speakers not for their content, but for their process. (Some teachers do this same work with a video of kids discussing, if they feel like their class isn’t quite ready to demo it themselves, or hasn’t practiced that particular skill yet). Recently I sat in on a fishbowl activity in an 8th grade classroom in the Bronx. Lynn Harrison, the teacher, wanted to set kids up to have more productive partner conferences, and so she asked two girls to model this for the class while their peers watched and listened for phrases and actions that made the conference work. Prep the kids in advance! It’s okay if it’s a little bit staged – that’s better than it being a complete disaster. Set up the rest of the class to watch for exactly what you want them to see. For instance, you could ask some, or all, of the kids to watch for what the partners say (jotting down specific phrases that seemed helpful), what the partners do (like eye contact, active listening, and the like), what the partners seem to have done in advance (like thinking of questions or troublesome parts they want help with). Remember that you’re doing this so that the rest of your class can be independently doing the same level of work later – so don’t participate, or jump in to “save” the discussion. If the kids demonstrate imperfectly, it’s fine! But if you have to heavily intervene in order to make it work, then the rest of the class will expect that level of intervention when it’s their turn to try. Debrief afterwards – lightly. Try to collect some of the key phrases or actions that the students notice on a chart, and resist the urge to personally point out every last thing that was done well. Have you done this in your classroom? How did you make it productive?